A few weeks ago, my younger son, Christian, and I were the only ones home for dinner. I asked him if, for a special treat, he would like pancakes for dinner. His eyes lit up and he smiled broadly. The question was clearly rhetorical! He put in an immediate request to have these pancakes during our summer vacation in the mountains where blueberries abound every summer. 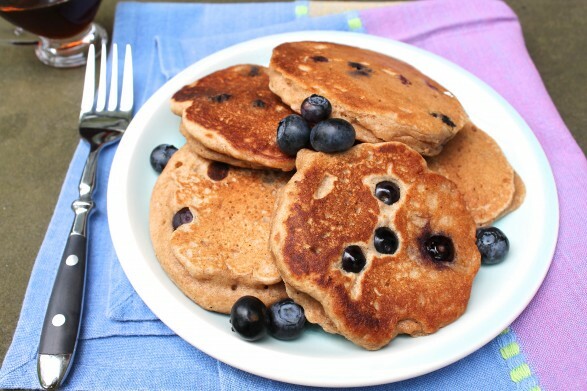 When I recently made these with chocolate chips instead of blueberries, I garnished the pancakes with about five extra chips. To Christian’s delight, he found that the chips became melty and gooey, and he could spread them over his pancakes like icing. The upside of this was that he didn’t need syrup! I have also found that I can dot a few chocolate chips over the pancakes once poured into the skillet rather than mixing them into the batter. Strategically spreading them out allows a few chips to go a long way and keep these otherwise healthy, wholegrain pancakes mostly healthy. My husband likes his pancakes plain, so this approach keeps everyone happy. The same may be done with blueberries. If everyone in your house prefers a loaded pancake, however, feel free to mix in your topping of choice. However you choose to enjoy them, these pancakes might even convert the staunchest white flour pancake fan. If you try them, I’d love to hear if your family enjoys these as much as mine does. I hope they do! I am not one to frequently sift flour in my recipes, but taking a minute to do so here will allow you to use all whole wheat flour and still achieve a light pancake. Using a fine mesh strainer and gently tapping the contents over a mixing bowl is a quick and easy way to do this. Yields 10-12 (3 to 4-inch) pancakes. Sift the flour and baking powder over a bowl, and then set aside. Beat the egg in a mixing bowl. Mix in the brown sugar, and then add 1 1/4 cups milk, the vanilla, and salt. Preheat a heavy-bottomed skillet over medium heat. (I love a cast iron skillet for this.) Add a couple teaspoons of oil, just enough to coat the bottom of the pan. Pour approximately 1/4 cup of the batter into the pan for each pancake. Cook until beginning to bubble, about 1 1/2 minutes. Flip, and continue cooking until golden brown, adjusting your heat as necessary (I often have to reduce the heat to medium-low after the first few pancakes) and adding an extra teaspoon or so of oil with each batch. Serve with maple syrup or toppings of choice. Any leftovers may be refrigerated or frozen. I like to reheat in the toaster oven until just warm. If you would like to keep the pancakes warm until serving, place them in a 200-degree oven while cooking the rest. Brown sugar adds a hint of sweetness and moisture to this recipe. However, if you choose to substitute honey or maple syrup, I recommend reducing the amount of milk added initially. Start with 1 cup and add a tablespoon at at time until a thick but pourable consistency is achieved. Ann – I just made these this morning for Carly. They were yummy! She is picky so I was worried the whole wheat thing might throw her – but she didn’t even know the difference! Thanks for a quick Sunday morning treat! So glad they were a hit, Abby. Enjoy your Sunday and thank you for letting me know! These look delicious! Such a good way to get some extra nutrients in. Do you know how many this recipe makes? This recipe will make 10 to 12 (3- to 4-inch) pancakes, Emmy. Hope you enjoy them as much as we do!